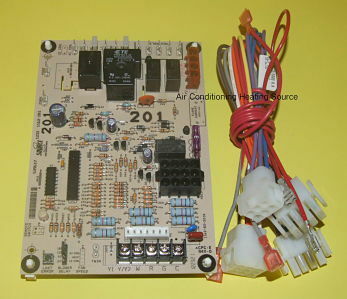 Ignition Control Circuit Board with Wiring Harness (23IF to 6DT-1)used in Coleman; Luxaire; Winchester; York equipment. Replaces Part Numbers: S1-43101972100; S143101972100; S1-03109167000; S103109167000; S1-03101933000; S103101933000; S1-03101267000; S103101267000; S1-03101267001; S103101267001; S1-03100662000; S103100662000; S1-03101250000; S103101250000; S1-03101266000; S103101266000; S1-03101284000; S103101284000; S1-03101973000; S103101973000; S1-03101972000; S103101972000; 265901; 265902. Used in Coleman; Luxaire; Winchester; York Models: BGD05012AX; BGD07512AX; BGD07516AX; BGD10016AX; BGD10020AX; BGD12520AX; BGM05012AXD; BGM05012AXU; BGM07512AXD; BGM07512AXU; BGM07516AXD; BGM07516AXU; BGM10016AXD; BGM10016AXU; BGM10020AXD; BGM10020AXU; BGM12520AXD; BGM12520AXU; BGU05010A; BGU05010AX; BGU05012A; BGU05012AX; BGU07512A; BGU07512AX; BGU07516A; BGU07516AX; BGU10016A; BGU10016AX; BGU10020A; BGU10020AX; BGU12520A; BGU12520AX; BGU15020A; BGU15020AX; GMB05012AXD; GMB05012AXU; GMB07512AXD; GMB07512AXU; GMB07516AXD; GMB07516AXU; GMB10016AXD; GMB10016AXU; GMB10020AXD; GMB10020AXU; GMB12520AXD; GMB12520AXU; GUB05010A; GUB05010AX; GUB05012A; GUB05012AX; GUB07512A; GUB07512AX; GUB07516A; GUB07516AX; GUB10016A; GUB10016AX; GUB10020A; GUB10020AX; GUB12520A; GUB12520AX; GUB15020A; GUB15020AX; UGAA075BUA; UGAB075BUA; UGAB100BUA.